In old family albums, the happiest pictures are those in which everyone is smiling, looking at the camera and there aren't any grim, worn out faces. A way to ensure perfect family albums is by sharing the load. In today's day and age,when women are taking equal responsibility in the economic affairs of the home, it is time for men to step up and take responsibility of the household chores too. When I dream of a house, in the future, when I am married, I cannot fathom the idea of coming to home and seeing my wife immersed in the chores of the household. It wouldn't only fill me with guilt, but will also create a sense of alienation in the relationship. You cannot treat someone like a servant and then expect to be friends with them. I intend to be my wife's best friend and for that I need to share her load. How beautiful would it be to learn to cook the breakfast, toss some salads, do the dishes and wash the clothes while the radio plays one's favourite song and the significant other looks at you with admiration. I want her to say that she is lucky to have found me. It is the race to winning the 'Best Husband' award and one has to do whatever it takes to get there. Of course, there is more to it. When you're helping share the load, you, as a couple, work like a functioning unit. The environment at home is not that of complaining and whining but, of whistling and smiling. You find things getting done smoother than before. Also, the kids get to see the true sense of a marriage which is companionship. Our patriarchal setup has created too many dads who just read their newspapers and order for their morning tea as the mother runs around the house. It is time we changed that. It is time we created dads who hugged the moms from behind as she chopped onions in the kitchen, dads who cooked the curry as the moms doled out those perfect rotis for lunch. We need more dads who did the dishes and moms who went grocery shopping. We need dads who changed nappies and moms who drove the car. There needs to be a change. This change will create better dads and moms and in turn, better homes. 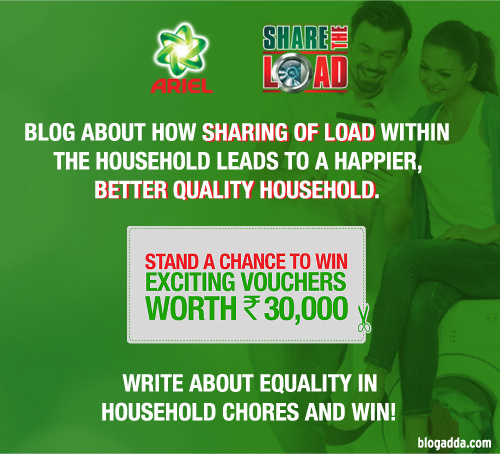 We need to share each other's load.